I offer weekly 50-minute sessions for a variety of concerns. I provide clinical supervision and consultation services to psychotherapy trainees, interns, psychological assistants and other professionals. See this page for more information. I partner with a physician to offer a combination treatment of ketamine within a therapeutic frame. See our practice website for more information. San Francisco fixtures: iconoclasts, artists and creatives, activists, performers, subculture kids, nerds, and self-identified weirdos; from natives to newcomers, all are welcome! I am trained in and practice from a harm reduction perspective. This is a collaborative, common-sense approach designed to meet YOU where YOU are at, and to help you to set your own goals for change. Many of us have had some sort of psychedelic, transpersonal, or psychospiritual experience in our lives. It can be a challenge to understand and incorporate the insights that arise during these events into our everyday selves without support and a nonjudgmental space. Integration can also assist those who have had difficult experiences to safely work through the material elicited by psychedelics. Trying to figure out who you are and where you're going? Wondering how to succeed without forcing yourself to fit in? Need to talk about your gender presentation or sexual orientation? Want to discuss size acceptance or Health at Every Size? Sometimes our social groups don't provide the space we need to discover new aspects of ourselves, and therapy is a great place to do just that. I blend cognitive-behavioral techniques and mindfulness practices with methods to help you understand yourself at a deeper level, and make lasting change in the underlying causes of these issues. When it comes to tackling significant distress, practical coping tools AND deeper insights go hand-in-hand. Human beings encounter scary events and painful losses, but we are able to survive--and even thrive--when we support each other. Whether you are trying to adapt to something recent and shocking, or looking to heal from a longer history of trauma, I help you to create safety in the present day, accessing the powerful survival skills you already have. Let's begin to rewrite the script of your life together. I remain aware that therapy happens within a social and cultural context. Supporting members of marginalized groups means making a place for discussing issues related to oppression when appropriate. Healthy, productive conversations allow us to gently--yet unflinchingly--examine privilege and discuss intersectionality in ways that make our communities stronger. Our culture pathologizes aging, preventing us from supporting or celebrating the stages of our adult growth. Finding meaning in the second half of life can be a rich process, and I offer space for this new layer of discovery. How would you like your life to be different? Have you found change to be surprisingly hard? You’re not alone--we all struggle with motivation and feel stuck in our patterns. I have helped even those who felt their lives were hopeless make real and substantial change. I have nearly a decade of experience in assisting people to recover from job loss, make major life transitions and change careers, deal with workplace behavior and politics, address creative blocks, apply for disability, and engage in effective job searches. I can help you explore your talents and passions to find more meaning in your work. Anger itself is a normal, human emotion! Though interpersonal conflict is an inevitable part of life, seldom are we taught the skills and coping tools to manage situations assertively. Learn how to express your needs AND preserve your relationships. The constraints of our culture can make it difficult to speak about psychospiritual experiences and non-ordinary states of consciousness. I have acquired additional certification in supporting spiritual growth and exploration from a nonjudgmental, curious stance. Next: learn more About Me, or Contact Me for your free phone consultation. Photo credit: Phelan Riessen. 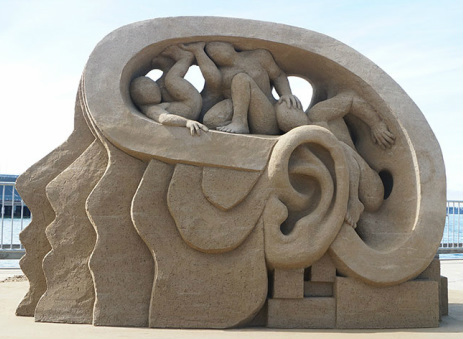 "Braintrust" sand sculpture by Rusty Croft.